The School of Public Health and Health Sciences is a national leader in finding ways to maximize public health and quality of life. The school addresses complex health issues by integrating traditional core areas of public health with related health science disciplines, fostering a unique environment in which transdisciplinary research collaborations can flourish. Our award-winning faculty focus on many pressing public health problems as well as crosscutting issues such as obesity and diabetes prevention, women’s health, global health, aging and healthy living, and autism spectrum disorders. The school features numerous opportunities for community-based student internships and experience in clinical and outreach programs and partnerships that promote health and the quality of life in diverse populations. The school offers a wide range of academic programs, including bachelor’s degree options in communication disorders, kinesiology, nutrition, and public health sciences and master’s and doctoral degree options in communication disorders, kinesiology, nutrition, and the five core areas of public health (biostatistics, community health education, environmental health sciences, epidemiology, and health policy and management). The school also offers flexible off-campus academic programs, including the highly-rated online MPH in public health practice program that allows students from around the globe to earn a master’s degree in public health, a new, fully online MPH in nutrition, and the Worcester Campus MPH Program located at the University of Massachusetts Medical School. 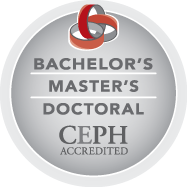 The School of Public Health and Health Sciences is fully accredited by the Council of Education for Public Health and is a member of the Association of Schools & Programs of Public Health. Public Health and the Health Sciences have a long-standing tradition at the University of Massachusetts Amherst. The Department of Public Health was first created in 1938, and was soon followed by the Department of Foods and Nutrition in 1945. The Communication Disorders program dates back to the 1950s, and the nation’s first Department of Exercise Science (later to be renamed Kinesiology) was born at UMass Amherst in 1965. The School of Health Sciences was established in 1973 and later reorganized in 1989 as the School of Public Health. In 1993, the School of Public Health and Health Sciences (SPHHS), as we now know it, was created, merging the traditional public health disciplines with closely aligned health sciences, specifically nutrition, kinesiology, and communication disorders, to form a unit unique in its interdisciplinary approach. Each of the departments in the SPHHS shares a commitment to optimizing human health and well-being. The SPHHS mission emphasizes transdisciplinary research, and concrete examples are readily available in the arenas of diet, physical activity, and healthful behaviors through the lifespan; health services and programs in low-income communities; training and education for caregivers to elders, institutional workers, and other target groups; and wellness programs and empowerment strategies for youth. The school continues to flourish as its faculty, students, and alumni lead the way in solving the complex challenges to the public’s health and well-being. Together, we’re working to optimize the quality of life for communities locally, regionally, nationally, and worldwide. The SPHHS will address the complex challenges of improving the public’s health and well-being. To optimize the public’s health and quality of life through innovative education, research, outreach, and practice using approaches that integrate the core areas of public health and health sciences.